OK, it sounds simple. To take a shot in bright daylight just focus, point and click. Easy. No, not so easy. You need to think about your photography stance. Why? Breath, shift, close, stab and roll – that’s why. These are some of the things people do when they take a photograph. Here is the full sequence. They line up the shot – everything just so… Then, they take a breath and shift their weight. Suddenly, they close their eye and stab the button followed by something I call ‘the roll’. The roll is where the camera is whisked away from the face to see the subject of the shot. This sequence causes movement through the shot. Being aware of these problems helps you to adjust your stance and breathing. Then you can take the shot in a fluid way. Building up a steady, controlled set of actions will train your body and mind. This training helps to prevent the movements that cause loss of sharpness. The sequence of a controlled shot should be deliberate and rehearsed. Through the shot your photography stance should aim to avoid the uncontrolled movement of the ambush. Hunt your shot with deliberate, stealthy moves. Here are some tips to help you get a sharper shot. The basic foot/leg position is critical. Stand still, with your feet apart. Slightly more than one length of your own foot should fit between them. One foot slightly forward helps. Make sure you are comfortable. Your back should be straight and neck upright. Tuck your elbows in to your body to create a triangle-of-support for your camera. Your right hand should hold the camera hand-grip. The right index finger should be poised lightly on the shutter button. Your left hand should be palm-up under the lens supporting its weight. Your left-hand fingers should be free to focus without shifting support from the lens in your palm. 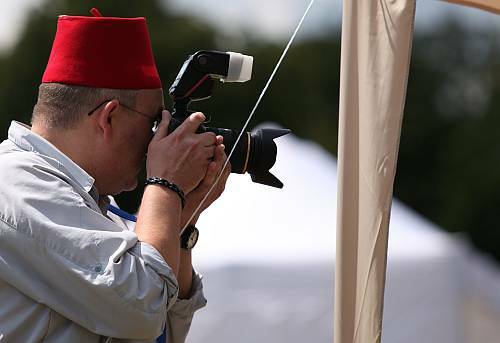 The camera eye piece (viewfinder) should be gently but firmly held to the ridge above your eye. It will act as another stable point but allow you to see comfortably though the eye piece. Once the camera is comfortably held to your eye, you can compose the shot. Hold your stance. Breathe smoothly during this composition. A good photographer has a ‘way’ of breathing. People often take a sharp in-breath before shooting and hold it. That causes movement and an unbalanced position. And, your heart-rate quickly goes up too. More movement! Think about your breath. Once you are aware of your pattern of breath you can control it. Keep your breathing smooth and under control. Find the top or bottom of the breath – your choice. At that point in the breath there is a brief moment when the body is still. Shoot then! You may slightly delay the next phase of your breath until the shutter has shut. (OK, that could be interpreted as holding your breath). Try it until you are happy with the result. When ready to shoot, DO NOT stab the button. The smoothest method I have found is to have my button finger poised at the edge of the button and turned out slightly at the outset. To shoot, I roll the finger onto the button. It’s only a tiny movement. Then the contact is composed and relaxed. Work on a smooth motion like rolling pastry. All the time keep your hands firm but relaxed – not strained or white knuckled. Finger poised ready to roll onto the button. Some people roll the index finger down onto the button from the side. This will work too as long as the movement is under control and smooth. Your photography stance will hold you in a stable position while you press the button. So make sure you are holding your position. 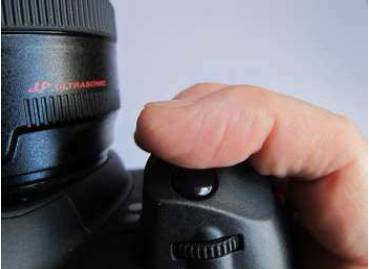 Roll your finger onto the shutter release button - maintain your photography stance. While pressing the shutter button don’t close your working eye. Many people blink in anticipation of the shot. Look through the lens for as long as possible. This helps control the hand movement and steadies the camera. The action of the mirror/shutter will block your view during the shot. If you are prepared you will not flinch or change your photography stance. Now you use the “anti-roll bar”. ‘Bar’ yourself from rolling the camera away from your face the instant you press the button. Before I found out about this I ruined many shots rushing the camera from my face after the shot. You will often find, in your enthusiasm, the removal is premature. Movement is introduced while the shutter is still open. To overcome this tendency slowly say “one thousand” to yourself after the shot (takes one second). Next, gently remove the camera. Practice it and soon you will not do ‘the roll’ any more. Put these tips together and you will return controlled shots. It will help break the cycle of frenetic composition and hasty captures. With practice your shots will get sharper and more considered. You will be making the shot, not snapping it. With proper use of the photography stance you will have sharper images and better control. This entry was posted in Background Info., Starters School, Tips Tutorials & Techniques and tagged Approach, Camera, How to Shoot, Photography stance, Stance, Time. Bookmark the permalink. Agree with the comments about breathing and not ‘rolling off’ – very good advice. I’d also add that tripods have three legs for a reason stability. Humans only have two legs and rely on our muscles and nervous system to balance. You can help reduce movement by giving yourself a third anchor point – leaning against something is probably the easiest. If your camera has a viewfinder and a screen, try using both on a longer exposure and see what the result is – I find that holding a camera up to my face to use the viewfinder is much more steady than holding it out in front of me to use the screen. The face adds a third support point in addition to your hands. My mother is reaching the age where reading glasses are required for close viewing and she tended to hold the camera way out in front of her so she didn’t have to put her reading glasses on. This resulted in blurry pics which were much improved when we replaced her camera with one with a viewfinder so she could use it ‘normally’. Thanks for those points Andy. Sometimes we forget that the face is a support fixture for the camera. It’s all too easy to forget that the camera is right in front of our face sometimes – we get so used to it being there!